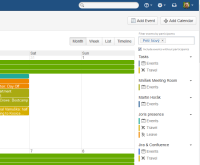 [CONFSERVER-50109] People Calendar to support filtering function for specific person - Create and track feature requests for Atlassian products. Customer would like to register all event (Actually, it is rough plan for work rather than single day event) for each people in the team to People Calendar. Once events were registered, customer would want to see the events for specific person. It would be good for People Calendar to support filtering function for specific person.